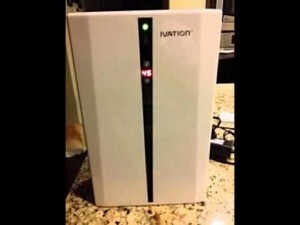 Ivation - IVADM45: Dehumidifier Review • The Air Geeks, reviews of air conditioners, dehumidifiers and air purifiers. The IVADM45 is a whisper-quiet dehumidifier. This compact appliance is optimized to free your room from excess moisture while consuming minimum energy, and taking minimum space : centered on the “Peltier” technology, pioneered by Ivation, it has no moving parts, which, supposedly, makes up for smaller, lighter unit. But, as we will see, doesn’t have only benefits. As you know, high levels of humidity can cause mold and mildew to grow in your housen and it is also difficult to breathe comfortably in a dumpy environment. But not everyone can spend $300 in the bigger, more efficient competitors of the IVADM45. 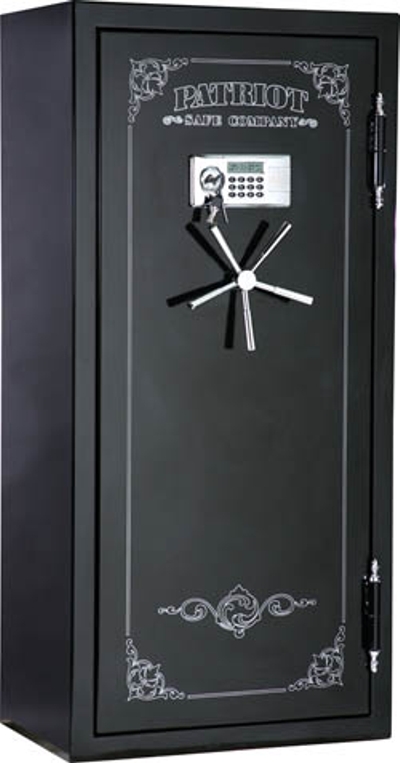 So if your room is relatively small, then the IVADM45 is designed to suit your needs. Will it suit them, though? Our review follows. See, the “Peltier technology” works : the IVADM45 is only 13,8 inches high, and very light at that. For its size, the IVADM45 is a powerful dehumidifier that is designed to remove excess moisture from your house without producing disturbing noises. This unit is optimized to run for many years without breaking. You should consider the size of your room before selecting a dehumidifier. High capacity units are designed and optimized for large rooms and vice versa. According to the manufacturer, this unit is suitable for a 2,200 cubic feet space. However, our tests showed us that only half of that could be expected if you count on full, proper dehumidification. This is not a big deal : the unit is still suitable for small bedrooms, laundry rooms, and bathrooms, to mention a few. this unit not only dehumidifies, but also helps to eliminate unpleasant odors and mustiness to give your room a truly comfortable environment. An auto humidistat helps a dehumidifier to run only when it is necessary. If the unit continues to run even when the relative humidity is at the desired level, energy is wasted and the system wears down faster that it should. The IVADM45 features an auto humidistat that continuously monitors the relative humidity of your room to ensure that the unit only runs when it is necessary. When the set level is achieved, the unit stops and waits until the level increases by 5% to start automatically. Furthermore, this dehumidifier allows you to set your desired relative humidity between 40% and 80%. It comes with a default setting of 50% RH. The IVADM45 features a removable water reservoir that has a capacity of 2 liters. The unit can run for 2 days without the need for you to empty the tank. What happens when the tank is full? This unit is designed to shut off automatically when the tank is full. This helps to prevent water spillage on the floor. In addition, this unit features an indicator light to notify you that you need to empty the tank. Very quiet operation. This dehumidifier is among the quietest units in the market. It does not feature moving parts (that are often responsible for shaking inside). Consumes minimum energy. This unit is designed to consume minimum energy. It is an ideal option for people who want to save money. Does not produce excess heat. It is common for dehumidifiers to produce heat that is likely to warm the room. Does not offer continuous drain option. Most dehumidifiers allow users to connect a standard garden hose for continuous drain of the collected water. This dehumidifier does not offer that option. Some users feel that it is a tedious process to empty the tank manually. Less effective. Of course, we would not recommend this type of device in high-humidity areas or large rooms. I recently moved into a house in the middle of summer and found myself in need of a dehumidifier. The walls and pipes in the basement dripped of condensation and because I plan on using this area for storage I would like it to have relatively low humidity. I ordered this unit along with an independent hygrometer. The hygrometer ranged from 85%- 95% relative humidity. I was in desperate need of something to get the water out of the air. My main worries were that the dehumidifier would run constantly and spike my electric bill, so I wanted one with a humidistat. I was still afraid a traditional dehumidifier, with a compressor, would contribute to unwanted heat to my home. I knew since my basement is only a partial and a mere 1,800 cubic feet a smaller unit would be fine. With all of this in mind I went to Amazon and found this unit. It uses Peltier technology instead of a compressor, has a humidistat, and can condition up to 2,200 cubic feet while getting 25 oz of water per day. With the three reviews it had at the time I was hesitant because they all seemed to be given instead of purchased and I'm always wary of buying more pricey electronics and appliances without excellent reviews. It seemed perfect! When I got it, it did seem very small, but considering it didn't have a compressor, it didn't have to be so big so I looked past the size. The cord has a converter for it, like a laptop. I plugged it in and turned it on. The first thing I notice is how quiet it is. In a dead silent room, it can be heard, but it is very quiet. The second thing I noticed was the barely noticeable, minute amount of air it was actually moving through the unit. When I put a piece of paper up to it, the paper sways slightly, but that could have been me breathing." Since I tend to set my temperature relatively high in the summer to save electricity my air conditioner is mainly used as an expensive dehumidifier. I usually set it to 80 degrees Fahrenheit in the summer months when the outside temperature is in the high nineties, but for my test I turned it off and used ceiling fans to circulate to air. After a few hours of operation in which I set the relative humidity to 40 on this unit, the inside temperature increased, but the comfort was such that there was little noticeable difference. It's a lot less expensive to run this than my central air. In fact, I did a quick estimation and this dehumidifier could pay for itself (in my household) in about three months. There are a few things that I do not like, but they are minor. The biggest peeve is when you set your relative humidity the display reverts back to the actual relative humidity that the unit detects and displays. It would be nice if there were two LED displays - one for the set and the other for actual, or a way to toggle between the two. the display is on the rear of the unit, which is great if you want t clean looking unit, but an inconvenience if you want to monitor the relative humidity or access the rear controls. However, those are my personal peeves and are minor. The reasons why I gave this five stars are: (1) it is already saving me money, (2) it is whisper quiet and does not add to the ambient noise in my music studio, and (3) it works exactly as described." 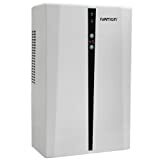 The Ivation IVADM45 is a compact and lightweight dehumidifier that is centered on the Peltier technology. This unit is optimized to run quietly and does not produce noticeable heat. In addition, this unit consumes minimum power and it is therefore an ideal choice for people who want to save money. Truthfully, it is only applicable as a satisfactory dehumidifier for very specific uses : cars, boats, small lockers / walk-in closets or music rooms. For all other uses, buyers will certainly favor more powerful options.